While we’re waiting for Wonder Woman to start, my mom tells me a “when I was young” story that I’ve heard a thousand times. The details of the story—cobbled from memories now 50 years old—shift slightly but the fundamentals remain the same: every couple of months or so, her mother would drive her to the Greyhound Station about an hour away for the sole purpose of buying Wonder Woman and Supergirl comic books. It was the only place around that bothered to sell those titles. There was a closer comic book store, a storefront in the downtown of the mid-size, Midwestern town of her childhood, but the owner refused to carry either of DC’s most famous heroines. The owner insisted, my mother remembers, that the boys whose eager purchases paid his rent had no interest in reading about girls; so the girls who were in fact interested went to the edge of town. I’ve heard this story for years. I heard it when Wonder Woman comics were easy to find on a Barnes & Noble shelf or when Supergirl was adapted for television or even when Agent Carter earned a television spinoff; the story gets recycled anytime a woman is center stage in the realm of superheroes, no matter the quality. Every time I hear this story, that particular bratty teenage “Ugh, Mom!”—a feeling as much as an exclamation—returns. I always treated this story as the kind of cost that mothers levy on daughters. That my mom, in return for her actions as my co-conspirator in the hunt for “strong female leads,” demanded acknowledgment, a yes, I get it, it was so hard in your day. I realized after watching Wonder Woman that I had been misinterpreting this story and its demands for decades. It’s appropriate then that, after a short and obligatory Justice League tie-in that serves as the movie’s frame, Wonder Woman turns its focus to the relationship between women—particularly the relationship between a mother and daughter. We’re transported to Themyscira, the home of Diana Prince (the fantastic Gal Gadot), an idyllic island inhabited by the strong but peaceful Amazons. The island, ruled by Diana’s mother Hippolyta (Connie Nielsen), tries to protect her daughter, the only child on the island, from the harm by concealing Diana’s true identity. She refuses to let Diana learn how to fight, refuses to let her essentially be an Amazon, but her decision is undermined by an eager Diana and her warrior aunt, Antiope (Robin Wright). In the course of the family disagreement, the history of the Amazons is told to Diana, conveniently illustrated in a text. It’s a pivotal moment for the movie, origin stories can often be tedious and their methods (an often overwrought soliloquy or constant flashbacks) can grind a movie to a halt. But director Patty Jenkins approaches the origins of Diana’s origin story deftly and creatively. The illustrated history is essentially animated; a late-Renaissance, Mannerist painting come to life. As the story is narrated, the classical bodies of the gods (the conflict of Zeus and Ares) twist and turn, their drapery elegant, their bodies even more so. The scene is incredibly painterly and that visual aesthetic repeats itself throughout the entire movie. This kind of luminosity—this painterliness—is Wonder Woman’s visual credo. It is elegant and captivating. The peaceful life of the Amazons is soon interrupted by a World War I German warplane that is shot down in the water nearby. Seeing the destruction, Diana swan dives off of a cliff and rescues a biological oddity: a man. The man, is, of course, Steve Trevor (Chris Pine), a British spy posing as a German pilot. Steve, followed by the Germans, brings the war to the Amazonian coastline and a short and almost balletic action scene follows. The often gimmicky speed-ramping trademarked by Zack Snyder is used here to great effect, it focuses the action on the twist and turns of Antiope and Hippolyta in particular, slowed down to almost reverently capture their elegant strength. Steve’s only purposes on the island are to ostensibly quip jokes about being a man (he insists he’s an “above average” example of a man, a true disservice to Pine), bathe shirtless in luminescent blue water, and to announce the devastation of World War I. Once dispensed with, Hippolyta says a sad goodbye to her daughter, and Diana and Steve set sail to London, effectively marking Act II of the movie. The London scenes are perhaps the movie’s best. Jenkins is unafraid to let Wonder Woman be many things at once: an action movie, a period piece, a comedy, and a romance. In London, Diana tries to navigate early-20th century gender roles which prove to her mystifying. Finding her Amazon costume inappropriate for the long skirts expected in London, Diana takes a trip to Harrods accompanied by Steve’s assistant Etta Candy (a scene-stealing Lucy Davis). In search of an outfit that is both appropriate but will also allow her the physical movement necessary to fight, Diana essentially plays dress up. Jenkins comedically deconstructs this scene, winkingly partnering the girls game of dressing up with the superhero’s game of disguise (there’s a jokey play off of Clark Kent’s glasses-as-disguise here). The scene, punctuated as it is by lush and beautiful costuming, is effectively an interlude to the war, still looming in the background. Two of the main villains, Dr. Poison (Elena Anaya) and General Ludendorff (Danny Huston) continue to plot, creating a deadly gas that even a gas mask can’t stop. Keeping with Jenkins’s quick pacing, we’re soon to the Western Front where Diana and Steve helm a rag-tag group of mercenaries on an off-the-record mission funded by an ostensibly peace-seeking English politician (David Thewlis). On the front, Wonder Woman doesn’t shy away from its possibilities—Jenkins’s camera is unafraid of death, depicted here as painful and bloody, refusing to treat it as something abstract or distant, as many comic book adaptations do. The carnage of the war is a moral conundrum for Diana who believes, as she was raised, that humans are essentially good, the perfect creation of Zeus corrupted only by the war-loving Ares. Here, as Steve and Diana attempt to stop the war, Wonder Woman shifts largely into an action movie, with comedic interludes. The pair, a wonderfully oddball couple, disagrees on how to best seek peace, but ultimately their goals are the same. Perhaps the most appealing element of Wonder Woman is how Jenkins handles female bodies on screen. In many respects, this is a truly visual film; its painterliness and elegance captures the fundamental contours of the character of Diana Prince, of Wonder Woman herself. That Wonder Woman is powerful is a given—she’s literally a god—but it’s easy to visualize power strictly as a show of force, as punches and fights. Diana’s power, though, exists well beyond its exercise in a fight, and it is intrinsic to the character. In order to demonstrate this Jenkins frames Diana in a series of images, in part an homage to her comic book source material. There are close ups on Diana’s eyes as she’s under fire indicating the heroine’s resolve and conversations between Steve and Diana are done frame to frame like a comic book, rather than the traditional cinematic pan, without devolving into kitsch. Even the action scenes visually hint at this: brick walls serve as frames, Diana often has to break through them, already in full action, to enter the scene. That’s balanced by the classicalness of it all. Diana’s body is constantly rising up as though levitating, from a trench in the front or from fiery ashes. Jenkins gives us these wide frames of Diana alone, scenes that recall the animated Renaissance paintings that opened the movie, without slipping into a fetish. The contrast of the classical tableau vivant with the use of speed-ramping in almost all of Diana’s fight scenes is a choreographic balance that results in a dance of sorts. There’s a back-and-forth that conjures up the quick, quick, slow, slow of a dance, effectively partnering power and grace—Diana gets to lead both. It’s a constant reminder that power is innate to the character and Gadot has the aristocratic carriage and gait to pull it off. In one particularly memorable scene, after the obligatory ultimate clash, the camera pans out, and Diana stands tall in front of the fiery aftermath. Jenkins has positioned her directly in the vanishing point, flanked by men whose shocked bodies are disoriented from the battle. The images are a series of visual counterparts: the weak and bruised bodies of the man in contrast to hers, still straight and muscular; their wrinkled, dirty clothes versus her perfectly unbending armor; their mortality versus her divinity. In his shock, one of the men stumbles onto his knees, it’s naturalistic—a believable response—but visually, he kneels to Diana. The image, one of Wonder Woman’s last, is in many respects the summation of the painterliness of the movie, drawn as it is from hundreds of Renaissance paintings, following a well-established tradition of depicting the divine as well as its earthly manifestations. The scene was still—the aftermath of a battle—but its action implicit and Diana’s power explicit. It was a perfect scene, born of clear reflection on what it means to show a powerful woman. Watching it, I was reminded how rare such scenes are in film or even in visual culture. I realized then what my mom’s story was about—about the feeling of centeredness, that need to feel the proxy thrill of simply being powerful, if only for a few hours. I will admit that my inner critic resists calling Wonder Woman empowering, and I am disinterested in suggesting that feminism can be molded in a film studio whose purpose it is to make money. But, by the end of the movie, that inner critic was silenced by the pure thrill of watching Wonder Woman, of finally seeing a woman in a superhero movie who isn’t dispensable and who wasn’t reduced to girl power one-liners; of finally watching a woman-helmed movie that seemed to truly understand the needs of Midwestern girls in the 1960s like my mom; girls who were told that no one was interested in them but knew that Wonder Woman was. 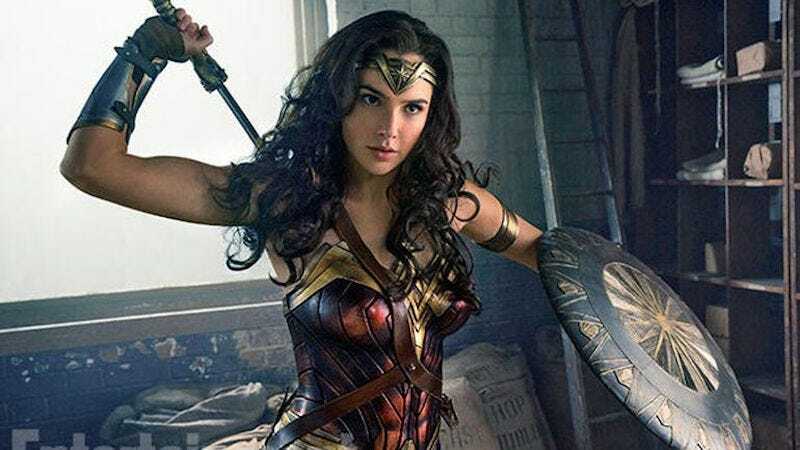 I was happy to remember the childhood rush of make-believe power I felt pouring over those comic books or wearing my Wonder Woman Underoos (in this respect, the criticism over the lack of women of color in the film seems like an especially pertinent one). Wonder Woman is the superhero movie that I’ve been waiting to see and, I suspect, after a string of critical failures the one DC wanted to make. This is a star-making performance for Gadot and, I hope, the proof Hollywood needs that women can make major studio films. As for my mom, she cried and insisted that I tell everyone to “take their daughters.” So go see it, and enjoy the momentary rush of that much-needed feeling that you can take on the world.